I got Null State by Mikael Bergström at GothCon XXXV, signed and numbered. I have followed the development at a distance, but never quite understood what the central idea of the game was. Null State is 74 pages in a format that almost is A5, but a few millimeters short on the width. The text is single column, but large enough and surrounded by huge margins that makes it easy to read. It is a nice and quick read. There are numerous illustrations by the author and Ronny Jacobsson, all very nice and they fit the gritty feel of the game well. The world is constantly under threat of destruction from science gone wrong. The GM is recommended to use articles from popular science magazines as inspiration and background for adventures. The PCs are ordinary people (who might have some minor super powers) that have been recruited by an organization that calls itself Null State to put themselves in peril to save the world from those threats. Often on short notice, and with a high mortality rate among the PCs. It is assumed that the organization has other operatives nearby, so when a PC dies the player get back into the game as soon as he or she has built a new PC. The game lists Global Frequency by Warren Ellis as one of the main inspirations. I have not read that book so I can’t say how close the game gets. The rules are simple, character generation is just a matter of distributing 12 points over the six stats, and making up a few specialties. Task resolution is done by simply rolling a D6 against the stat, under or equal is a success. Null State is played in the traditional style with a GM and a set of players, the players play their characters and the GM takes care of the rest. The chapter with ideas and advice on how the GM can challenge the PCs is twice the size of the rules chapter. I expect that a group will experience character casualties at a pace that rivals Paranoia. The setting is OK. I considered giving the game a weak rating since there isn’t much to work with when building adventures, and the Null State organization is not given much of a description. But it is an short little game for short little stories, and there is enough setting for that. But remember to pick up a popular science magazine before playing, it is your setting supplement. The form is good. It clearly explains how to prepare and run short games with adventures about people who save the world. There are a few examples of play in the game. My first instinct was to say ‘no’, the game is simple enough to suit new comers to the hobby, but rampart character death is something that I try to avoid when playing with such players. But on the other hand, there aren’t many games where you could run a full game in an hour and a half, or even shorter than that if you provide some pre gens. Null State might end up in my bag of games, ready to be run when I get a group of players who can’t commit to a full four or five hour game. 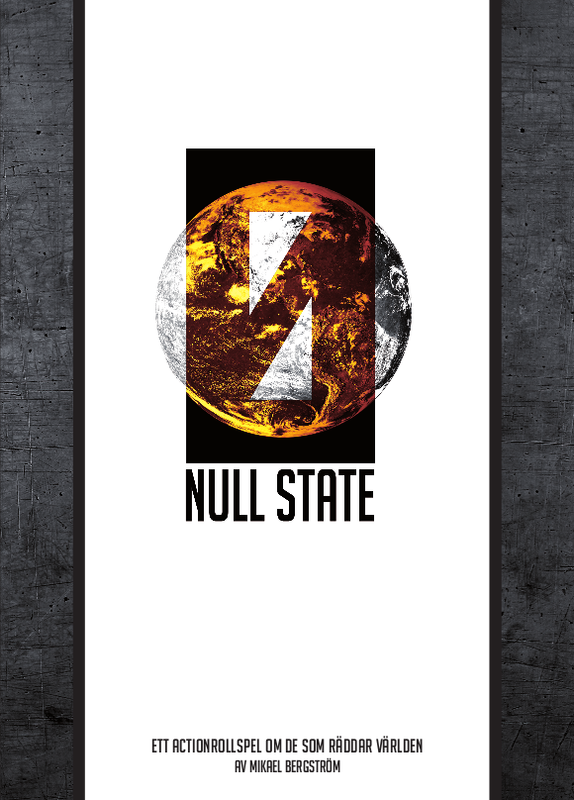 nullstate.se – The official Null State page. Not a word about the fact that you’re on the clock once you start playing? Isn’t that a pretty important factor for the form? Actually, racing the clock in the real time play sense is not a part of the core game. It is offered as a suggestion of how to heighten the suspense in some scenes. I kinda fancy the game, mostly because i find the game-setup really clever and fun. If it’s not already found in other games that I’m unaware of, I’d say that it could be successfully implemented in most matine and weird-science games. Like Hollow Earth Expedition for example.